The trade body for retailers in NI, the Northern Ireland Retail Consortium, has said they fear the threat of some community pharmacies closing will have a devastating impact on the patients and communities they serve. Speaking after meeting with Community Pharmacy NI – the representative body of local chemists – Aodhán Connolly, Director of the NI Retail Consortium, said that community pharmacists should be regarded as the Fourth Emergency Service and that the crisis created by under-funding from the Department of Health needs to be urgently addressed. Prior to the collapse of the NI Assembly, the last Health Minister, Michelle O’Neill, outlined a commitment to continue to develop and resource community pharmacy-based initiatives over the next 10 years. 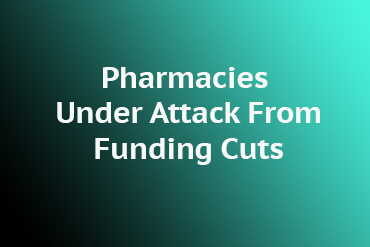 However, this is now in jeopardy due to the fact that the Department of Health is under-funding the cost of providing community pharmacy services by at least £20m. 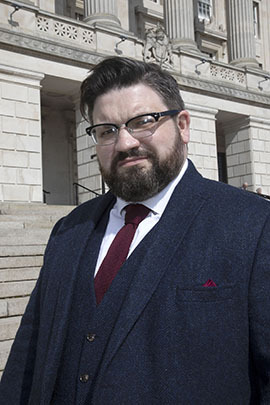 Aodhán Connolly, Director of the Northern Ireland Retail Consortium, outside Parliament Buildings at Stormont. Aodhán Connolly, Director of the NI Retail Consortium said: “Community pharmacy is essential in Northern Ireland and is tantamount to a fourth emergency service especially in rural areas where they take pressure off the already strained health service. Gerard Greene, Chief Executive, Community Pharmacy NI added: “This is an extremely difficult period for community pharmacy. “We are now coming to a critical point when some pharmacists are being forced to make tough decisions which may force them to close causing job losses across Northern Ireland and have a hugely negative impact on patients and customers. “We cannot afford more vacant units on the high street, especially those of the local pharmacist who provides much needed healthcare in a community setting. Rising incidence of violent crime.